One of your dog’s favorite activities is chewing. He or she will chew on just about anything if given the chance, which can be both unhealthy for your dog and destructive to your house. Fortunately, a bag of cow ears for dogs can keep your dog entertained in a healthy and productive way. There are many cow ears for dogs on the market. However, not all cow ears are the same in terms of quality and enjoyability. That is why we reviewed many of the top-rated cow ears for dogs in order to help you find the best cow ears for dogs. Although they appear to be simple cow ears, there are different features that set eat ear apart from the others. We reviewed flavors, size, availability, and the production process to find the best cow ears for dogs. Give your dog the best with these Best Bully Sticks Prime Thick-Cut Cow Ear Dog Chews. Our top choice, Best Bully Sticks Prime Thick-Cut Cow Ear Dog Chews, has the best combination of features that make it the leading cow ear for dogs. It is highly-rated by other dog owners, as well as the USDA and FDA. It offers a combination of healthy features as well as features that make it more enjoyable for your dog. Overall, your dog will choose our best cow ears for dogs over any other chewable alternative. The Best Bully Sticks Prime Thick-Cut Cow Ear Dog Chews is our top pick for best cow ears for dogs. When it comes to cow ears, there are several important factors that make these ears stand out. They are a healthy option for dogs of any age and are made with a production process that keeps chemicals out of the ears. These cow ears for dogs are made from grass-fed cows. These cows are not raised using chemicals and hormones, which can harm your dog over time. Plus, they have been reviewed and approved by both the FDA and the USDA. One of the best features of the Best Bully Sticks Prime Thick-Cut Cow Ear Dog Chews is that they are safer for dogs to eat. unlike rawhide, these ears are easier to chew and won’t damage your dog’s teeth. They don’t split or crack into small sharp pieces, which can hurt your dog unexpectedly. Plus, these cow ears are entirely digestible and are easy on your dog’s stomach. Help your dog relax and stay healthy with these Brutus & Barnaby All Natural, Whole Cow Ears for Dogs. The Brutus & Barnaby All Natural, Whole Cow Ears for Dogs are our runner up pick. These ears are also approved by the USDA and FDA for their production process and use of better ingredients. They are a healthy snack choice for dogs that are easy to digest and keep your dog entertained. One of the best features of these Brutus & Barnaby All Natural, Whole Cow Ears for Dogs is that they are not the easiest ears to chew, which is a good thing. They are made out of soft cartilage usually found in ears and skin. The increased amount of cartilage keeps them from falling apart quickly. That way, your dog will take longer to finish one ear without risking damage to his or her teeth. Although they take a bit longer to chew, Brutus & Barnaby All Natural, Whole Cow Ears for Dogs are easy to digest. Skin and cartilage break down easily and won’t cause a problem for dogs. This is especially helpful for older dogs and puppies, but dogs of every age benefit from an easy-to-digest treat. Keep your dog busy on a budget with these EcoKind Pet Treats Premium Cow Ears for Dogs. The EcoKind Pet Treats Premium Cow Ears for Dogs are our best budget pick of cow ears for dogs. These ears offer premium quality ingredients and entertainment for your dog, even if he or she is a power chewer. Dogs enjoy these ears since they take a long time to finish without a ton of extra effort. At just $15, you can keep your dog entertained for a long time with a healthy snack. EcoKind Pet Treats Premium Cow Ears for Dogs are designed for dogs that love to chew a lot. They are cut thick from natural ingredients so that they contain a high amount of cartilage. That way, your dog will have to take the time to break it down, which can take hours for even the most aggressive chewers. These ears are made with premium all-natural ingredients. The production process helps to preserve the natural health benefits of grass-fed, free-range Brazillian cows so that your dog gets all of the health benefits alongside the entertainment value. Get more than enough supply for your dog with this Redbarn Cow Ears. The Redbarn Cow Ears is a great option if you’re looking to buy cow ears in bulk. If you have a dog that loves to chew, you’ll probably go through them quickly. This pack comes with 100 cow ears, which should last your dog for a long time. These ears have a thinner cut so that they won’t will your dog up with extra calories. Instead, they are sourced from natural ingredients and processed so that your dog gets extra nutrition. Cow ears contain chondroitin, a nutrient that supports joint health in dogs. That way, your older dog can get extra joint support while enjoying a treat that won’t wear down his or her teeth. Give a big dog a cow ear to match with these Pawstruck Jumbo Cow Ears For Dogs. Some dogs need a larger cow ear to keep them from devouring cow ears quickly. If that sounds like your dog, consider the Pawstruck Jumbo Cow Ears For Dogs. A larger ear takes more time to finish, which means that your dog will be entertained longer. These Pawstruck Jumbo Cow Ears For Dogs are a good option for larger dogs, but even small dogs can enjoy them. Pawstruck Jumbo Cow Ears For Dogs are made using a process that reduces their odor. That way, they won’t smell as much while your dog eats them. The bag is resealable too so that you can keep them sealed to contain the smell and the freshness. Any dog owner that has a dog that likes to chew should bu cow ears for dogs. Dogs naturally need to chew and it is one of their favorite things to do. Chewing keeps them entertained, but also improves their teeth and gum health. Cow ears are among the safer chewable treats for dogs since they are made out of softer materials and most manufacturers use natural ingredients without chemicals. Cow ears for dogs also have health benefits like nutrients and proteins that support dog health. You can keep your dog from destroying your home with his or her chewing habits by offering cow ears as a healthy and delicious alternative. Plus, cow ears are available in a variety of cut sizes and package sizes allowing you to tailor your purchases to your dog’s preferences. Size. The overall size of the ear ranging from small to jumbo depending on how the manufacturer measures. Larger ears are a better option for larger dogs since they are likely to chew through them faster. Thickness. The overall thickness of each cow ear. Thicker ears make cow ears harder to chew through, so larger dogs or more aggressive chewers won’t eat them too quickly. Package count. The number of ears in a single package. Most cow ears come in packs of 10-12, but packs of up to 100 are generally available for some brands. Larger packages make it easier to have cow ears available when you need them, especially if your dog chews through them quickly. Ingredients. Cow ears are made from the ears of cows, usually with minimal processing. many manufacturers are sourcing materials from healthier cattle options to prevent the use of chemicals in their cow ears. Cooking process. The way that cow ears are prepared and cook. Different cooking processes change the texture and the nutrient/fat content of the ears. Most manufacturers prefer baking, but smoking is also a popular option. Are cow ears safe for dogs? Yes, cow ears are safe for dogs to eat. Cow ears are comprised of cartilage, the soft material inside your ears, and skin. When cooked using heat-only (no-flame) methods, these materials start to dry out without becoming brittle. This gives them their chewy texture, as well as keeps them from splintering into difficult-to-eat pieces. As dogs chew, the ears breakdown and soften making them easier to eat. Are cow ears digestible for dogs? Yes, dogs can digest cow ears. Cartilage and skin are both soft materials that dogs would naturally eat. They break down relatively quickly in dogs’ digestive systems and don’t put much strain on them. Without additives and chemicals, dogs can digest cow ears easily. This makes them a good snack alternative for older dogs and puppies. Are cow ears considered rawhide? No, cow ears are not considered rawhide. Rawhide is more like an edible leather that is made out of thick pieces of dried skin. Cow ears are made mostly of cartilage, a soft sinue-like substance found in ears and other soft parts of the body. When cooked, cartilage and skin begin to harder, but they do not take on the tough texture of rawhide. Instead, they stay relatively soft and chewy making them an easier-to-eat alternative to rawhide. Can dogs eat cow ears every day? Yes, dogs can eat cow ears every day. Some dogs eat multiple ears every day. A dog’s natural diet can include animal parts and cow ears are a soft and easy-to-digest option. While it is possible for dogs to eat many cow ears in one day, the amount that your dog should eat depends on your dog. You should keep an eye on your dog to see if there are any effects like overeating or an upset stomach. Cow ears generally do not cause any problems for dogs, but it is possible for a dog to overeat and feel sick from overeating. If you want to give your pup a bit more variety, you should also check out our reviews of the best pig ears for dogs and the best dog chew toys. We looked at 20 other cow ears for dogs. Even though they didn’t make our 5 best cow ears for dogs list, they’re the best of the rest and each is still a great option for your dog. The information you’ll need to compare each one is included with the listing. These 123 Treats – 100% Natural Cow Ears Dog Chews are a great place to start when looking for cow ears for dogs. They are available in 10, 20, 50, 100, and 200-count packages so that you can get as much as you need for your dog. When eaten in moderation, the larger packages can last up to six months. These ears are available in a brown or white version and offer many of the same health benefits. With a healthy cooking recipe, these ears are a healthy alternative for your dog. The Gogo Pet Products 100 Count Smoked Cow Ears For Pets is available in a 100-count package, which can last any size dog for more than a month. They are smoked to lock in the fatty and smoked flavor but have a reduced fat content. They are also high in protein thanks to their lean content. These ears are cooked using all natural ingredients. Barkworthies Bulk Cow Ears offer your dog a large number of healthy treats. They are made using natural ingredients that are not exposed to hormones, chemicals, or additives. The ears come in a large resealable bag so that you can keep them fresh. They are a healthy alternative snack for dogs of all sizes. Nature Gnaws Large Whole Cow Ears are made from a single ingredient, cow ears. The cows are grass-fed for more a healthier ear and to keep them high in protein. These ears come in a re-sealable bag that you can keep them in. That way, they are fresh when you need them. To avoid unhealthy chemicals in the ears, the cleaning and cooking processes don’t use chemicals at all. They are cleaned with water and baked until they are ready. This Top Dog Chews Jumbo Cow Ears, 100 Pack gives you 100 all natural cow ears. They are made using free-range cows that are grass-fed and raised to offer a healthier beef option. No chemicals are used in the cleaning and cooking process as well. To ensure the highest quality, these ears are inspected by both the USDA and the FDA. They come packaged in resealable plastic bags so that they stay fresh. These ValueBull Premium Natural Cow Ears Dog Chews offer many health benefits for your dogs. They help improve your dog’s teeth, coat, and joints through various vitamins and minerals locked into each ear. They help keep your dog’s teeth clean as well for longer lasting teeth. These ears are made with natural ingredients and are not bleached. That way, your dog won’t end up eating unhealthy chemicals. To ensure the highest level of quality control, each ear is inspected before it leaves the factory. The Best Buy Bones-Natures Own Nw95051 Cow Ears Vanilla Bulk pack comes in a pack of 50 ears. They are flavored using natural vanilla for a different taste. You can mix them in with other treat options to give your dog a range of flavors to choose from. These ears are baked, which reduces the fat content and locks in the protein. That way, they are healthier for dogs of all ages. 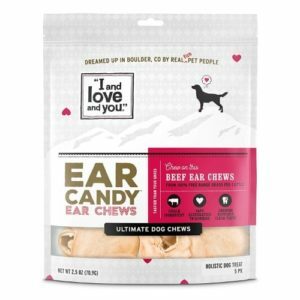 With less fat and a crispy but soft texture, these ears make a great alternative to harder treats like rawhide. Powerpet Natural Cow Ears for Dogs (Beef) give you several options for helping your dog stay healthy. The ears are made out of 100% all-natural beef and are easy to digest. For puppies and older dogs, these can be a relaxing treat that goes easy on their digestive systems. You can get these ears in a bulk pack of 25 and a larger pack of 50, which is more effective if you have multiple dogs. You can also choose between a smoked or natural flavor based on what your dog prefers. The Redbarn Pet Products Inc-Natural Bully Cow Ear 10Pk- Natural 4.2Oz pack of cow ears can be a healthier alternative for older dogs. These ears are made using blueberries and cranberries to add antioxidants. They are also formulated to improve your dog’s joint health over time. Plus, they provide support for healthy teeth and gums. Each of the Redbarn Pet Products Inc-Natural Bully Cow Ear 10-packs is resealable to lock in the freshness of the ears. Baxter Boy Prime Tender & Hearty Thick Cow Ears are made using larger ears so that your dog will eat fewer of them. Eat ear offers an extended period of chewing and enjoyment rather than letting your dog chew through several at a time. They are made using minimal processing method that preserves their nutritional value. Baxter Boy Prime Tender & Hearty Thick Cow Ears are made in a USDA-certified facility that is certified for making human-grade products. These ears don’t use flavors, colors, or additives, which helps make them odor-free. Brazilian Pet 100% Natural Large Size Real Cow Ears come in a pack of 50. Each ear is over six-inches long which is better for larger dog breeds. The ears come from free-range, grass-fed cows without hormones or other chemicals that remain in the ears. They are cut thick, which makes them a bit harder to chew through. Dogs enjoy the extra effort they put in making these ears satisfying and entertaining. Goodchews Cow Ears for Dogs uses all-natural cows to get some of the biggest ears on the market. These ears are nine-inches or longer, which is perfect for larger dogs or dogs that chew a lot. The cooking process does not use chemicals so that the ears maintain much of their freshness and nutrients. Plus, they help keep your dog’s teeth strong and healthy. HDP Beef Cow Ears JUMBO gives you oversized ears with a natural beef flavor. You can also get them in a smoked flavor if that is what your dog prefers. These ears come in multiple pack sizes from one ear to 100 ears. They come in resealable bags so that they are easier to keep fresh. There are no colors or flavor additives in these ears so that the natural flavor is preserved. Jack&Pup Prime Tender & Hearty Thick Cow Ears uses a high grade of beef to provide your dog with better tasting, healthier cow ears. The minimal processing method that Jack&Pup uses reduces the amount of fat while locking in vitamins and minerals. The result is a healthier chew option than rawhide or pig ears. There is less fat and grease in these ears too, which protects your home and keeps your dog healthy. The “I and love and you” All Natural Chews are an all-natural alternative to rawhide that is better for your dog’s teeth. These ears are made with a single ingredient to preserve their health benefits. Plus, they are fully digestible and easy on your dog’s digestive system. Because of the potential benefits and how easy they are on dogs, these cow ears are good for dogs of any age. These Barkworthies Protein-Rich Cow Ears are made for dogs with a medium chew strength. They can last a long time while still being easier to chew. They come in a pack of 10, which can last a long time. These ears are sourced using high-quality standards so that each ear is healthy. Cadet Cow Ears offer dogs a healthy alternative to other treat options. Because of the healthy ingredients and minimal processing method, these ears have a low-fat, high protein content. They also come in a bag of 20, which is enough to last most dogs for a long time. Sancho & Lola’s Natural Ear Chews for Dogs are processed to improve the experience for you and your dog. They are not greasy like other cooked treats can be, making them a cleaner option. The odor has been removed as well to avoid strange smells while your dog is eating. Dog owners choose Downtown Pet Supply All Natural Jumbo Cow Ears for Dogs because of their size. They come in a pack of 25 jumbo-sized ears, which can keep dogs entertained for a long time. Because they are so big, these ears take more time even the biggest dogs to chew through. Four River Canine Beef Ears – 6ct are made with a very minimal processing method to preserve their natural appearance and health qualities. This process is so minimal that it doesn’t even affect the coloring of the ears giving them a natural appearance and shape. They come in a small package of six, which also makes them highly affordable.